We utilize the power of dance, music, and creativity to improve mobility and quality of life for people with our Outreach Programs Dance for Parkinson’s, offered to people with Parkinson’s disease, their caregivers, spouses and partners, and Movement & Music, for older adults in Senior Centers, Retirement Living, Assisted Living and Memory Care Communities. Because Ruth Davidson Hahn & Company is a non-profit organization we need to raise funds for these programs. 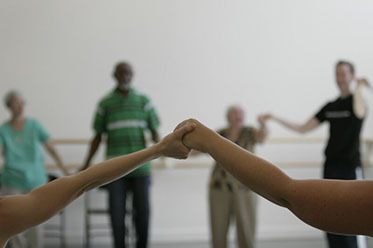 Your tax deductible contributions are needed to help us continue our very special work with the Dance for Parkinson’s and Movement & Music Outreach Programs. When shopping at amazon, use smile.amazon.com and Amazon will donate a portion of your purchase to support Ruth Davidson Hahn and Company. It doesn’t cost you anything extra. Click the banner below to select Ruth Davidson Hahn and Company as your preferred non-profit to support. With much appreciation and thanks for your generosity and support of Ruth Davidson Hahn & Company’s Dance for Parkinson’s and Movement & Music Programs.